Fort Fido Dog Daycare & Boarding News Blog: Two swell newcomers to The Fort! Two swell newcomers to The Fort! 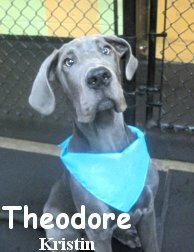 First up for their morning assessment was Theodore. Lovin' that name! He is a five month old, sixty pound, blue colored, Great Dane. Theodore is a very sweet dog. He hung out in our Medium Roll, where he will stay until he grows some more. He is in that lanky, teenager-dane stage lol. Theodore played well with the other pack members and truly had a blast. We look forward to having him attend. Our second assessment of the day was Jake. 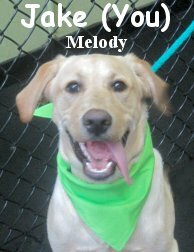 He is a high-energy, five month old, forty pound, Yellow Labrador Retriever. Jake also stayed in our Medium Roll, he may or may not move to the Big Roll in the future. He is the type of dog that absolutely loves to play and exercise. Jake interacted enthusiastically with several different dogs in his play group. This "dog's dog" is a wonderful addition to the Fort Fido pack and we hope to see him again too. O, by the way, I suppose I didn't mention that these two also became best buds today. They are the exact same age so it makes a lot of sense. It will be neat to see these two grow-up. Hopefully their daycare days will overlap. As far as clips are concerned, the one that follows, pretty much sums these two rascals up! P.S. The Fourth of July is upon us. Do have a happy and safe one! Bring your canine companion into The Fort. We will get them burnout like a falling bottle rocket... Well, you know what I meant haha. The pack will help them burn off that extra holiday energy. Also, although it will be our record night thus far, there is still plenty of room to board your pooch overnight, feel free to! Clips and Your Daily Dose of Dog news! Aspiring Model Diego and Dog Roll Action! Boarding going well & a terrific trio! A slice of the action at Ft Fido! New to the crew, Duke and Sophie!